“You mean kin-oe-ah?” the stock guy asks. ”No, I mean keen-wa, but yeah, same thing” I reply. I’ve only eaten the stuff 3 or 4 times at this point, yet I feel like I have to save this fella the embarrassment in the future and arm him with the correct pronunciation to educate my fellow shoppers in the future. I’m sure I came across as pretentious, but really I’m just a proficient user of YouTube. But I digress. We are here today to get just a little bit more healthy. If you haven’t heard of quinoa before, it is a powerful little grain of delicious nutrition. One cup of cooked quinoa contains around 15% less carbs and 60% more protein than a cup of cooked brown rice. For families like mine that eat a lot or rice, quinoa has now become the go-to, easy to prepare side dish alternative to rice for weeknight meals. There are several varieties of quinoa. The one pictured above is red quinoa, which I think has a nice nutty flavor (reminds me of boiled peanuts). Just use whatever variety you prefer and/or can find easily in your store. The grilled zucchini adds some much needed moisture to what can sometimes be a dry dish. Some people (like my wife) prefer to add a vinaigrette also to the dish to add more flavor and moisture. 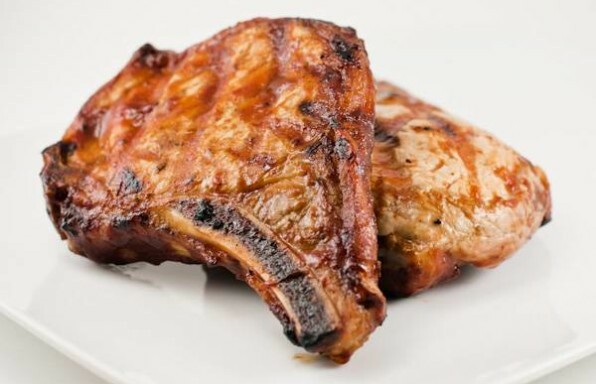 I’ll include a recipe for a simple one here as well. The following is a “starter” recipe for a great quinoa with grilled chicken dinner. Use it as a template and start modifying from there with whatever you have in the refrigerator. I like to grill up some mushrooms and throw in there if they are available. Have fun with it, it is all delicious! 1Prepare the quinoa per the instructions on the package. 2Cut the zucchini into 1/4 inch thick strips and grill according to these directions. 3While the quinoa is cooking, grill up some basil butter chicken or your favorite grilled chicken recipe (though that basil butter chicken will rock your socks off in this dish). 4Combine all of the vinaigrette ingredients in a bowl and whisk thoroughly. 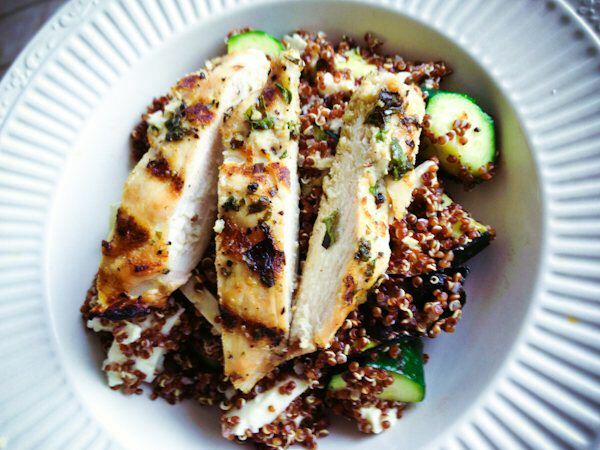 5Once your quinoa, zucchini, vinaigrette and chicken are ready, combine all in a bowl with the feta and enjoy!